The Kruger National Park is one of the most iconic national parks on the African continent. There are vast landscapes and amazing wildlife. You can take your family on game drives, as well as walking safaris. The Kruger is a great, accessible place to camp for the whole family. One of the newest camps in the Kruger National Park, Berg en Dal is situated in the bush. Opened in 1984, the area around Berg en Dal, has a variety of grazing animals, including: white rhino, kudu, impala, giraffe, elephant, reedbuck, klipspringer, grey rhebok and warthog. You can also see leopard and wild dog in this region of Kruger National Park. Camping in the Kruger National Park typically offers more luxury than many other African campgrounds. This campsite is no different. All of the campsites here are suited for caravans and tents; each site has a power point and a braai (barbecue) stand. If you’re tired after a long day of finding game, you can also hit the restaurant and cafeteria for meals. There is also a swimming pool if you’d like to cool off after a hot summer day. Getting to Berg en Dal is a breeze; it’s less than an hour from the Kruger Mpumalanga International Airport. Pool pump repair is available 24 h as well. If you are heading to Mozambique, the Crocodile Bridge Rest Camp is a convenient place to spend the night. It is only 7.5 miles (12km) from the Mozambican border. The flat area around the rest camp offers a great view of the Crocodile River and Marula trees that scatter the banks. The area around Crocodile Bridge Rest Camp is called “Southern Circle” and it is known for the various prides of lion that call this area home. It is also home to a large population of the Kruger National Park’s rhino population. You can also view San (Bushmen) paintings near the Hippo pool. These paintings are the only remaining remnants of the people who once lived and hunted in this area of Africa. The third biggest rest camp in the Kruger National Park, Satara offers a variety of accommodations. If you are ready for a break from camping, you will find plenty of options for guesthouses and bungalows at Satara. Traveling with a group? There are plenty of sites here for camping, with 100 campsites (all with power points); Satara can accommodate your entire group. If you need to stock up, you’ll find a well-stocked grocery store onsite. Located in the center of the Kruger National Park, Satara is a great place to see some of the world’s most famous predators: lion, leopard and cheetah all call this area home because of the fertile grazing land. This area is often called the “cat camp” because of the variety of large cats in the area. 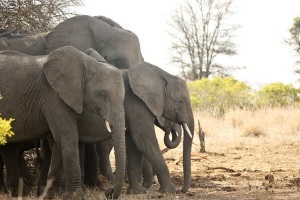 Kruger National Park is a great place to camp with the whole family. Check out some of our favorite campsites for great places to camp within the vast park.